The London Motor Show will be arriving at Battersea Evolution from the 5th– 8th May to showcase more than 40 car brands and 130 models to visitors from around the world. As the ultimate event in the automotive calendar the Show will provide the perfect platform to exhibitors wanting to launch their latest must-have models and display their vehicles in the UK for the very first time. Cars will range in price from £8,000 to in excess of £200,000 to suit everyone’s pockets. The lecture theatre will play host to a fantastic line-up of honoured speakers including, Sir Stirling Moss, Tiff Needell, Ben Collins, Nigel Mansell and Afzal Kahn who’ll be focussing on a number of major motoring issues. This Mexican designed and produced newcomer was first seen in the UK at the Goodwood Festival of Speed in 2013 and will use The London Motor Show to kick-start a packed global programme for this exciting new marque. 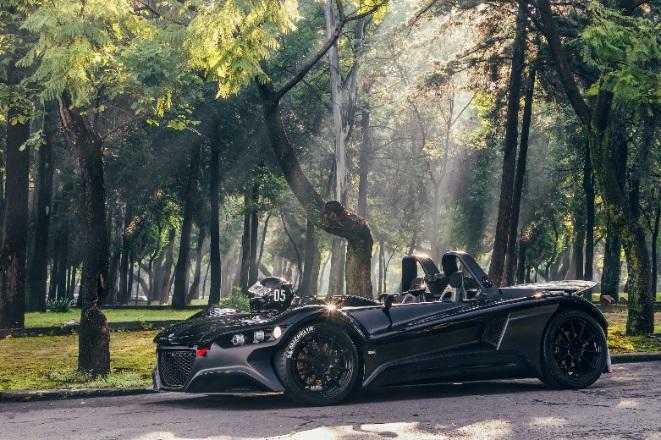 The VUHL 05 is powered by Ford’s award-winning turbocharged 2 litre EcoBoost engine, which is sufficiently potent to endow the two-seater with a mighty impressive power-to-weight ratio of 410bhp/ton. It’s currently for sale at a price of £59,995 from specialist dealer, Bespoke Performance. This innovative, two-seater hydrogen cell powered car, developed and built in Wales, will be on display at The London Motor Show. 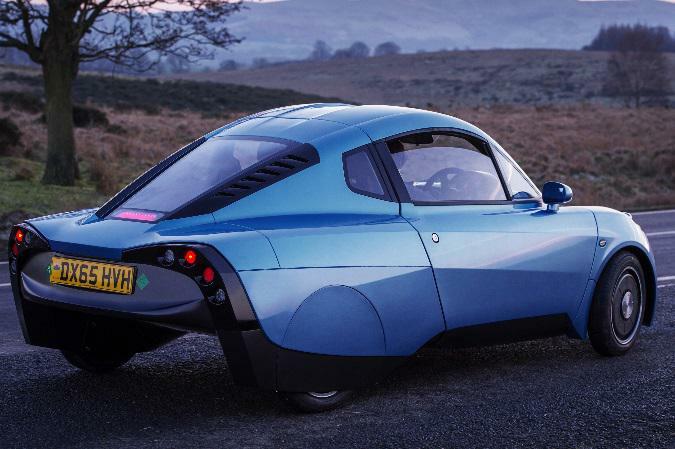 The Riversimple RASA is a lightweight and highly efficient, “network” electric car powered by innovative hydrogen fuel cell technology and it’s the first road legal, engineering prototype. This car perfectly reflects the objectives of The London Motor Show, which is to showcase not just the wide range of exciting new cars currently available to the public, but also to provide the opportunity of promoting significant developments in automotive technology and innovation initiated here in the UK. 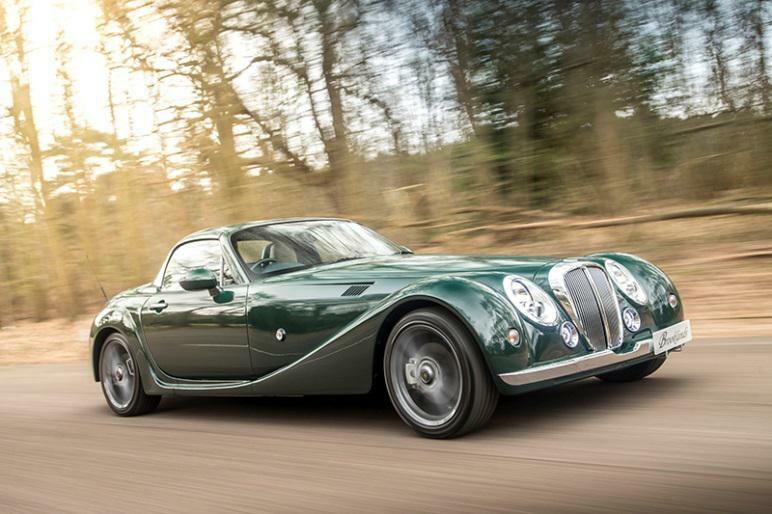 Mitsuoka Motor will be showcasing their limited edition “Brooklands” Roadster at The London Motor Show. Featuring a British sporting design of elegant flowing lines, the Brooklands Roadster combines timeless styling with advanced levels of modern technology, safety and comfort. Finished in true British Racing Green, the Brooklands uses the standard Roadster as a base, trimming the cabin in rich cream leather with green contrasting stitching on the seats, gear and handbrake gaiters and centre armrest. In keeping with classic British heritage, a burr walnut veneer dashboard panel has been fitted, as well as a headrest embroidered with the Brooklands logo. To complete the Brooklands, Mitsuoka commissioned special sports hand crafted wire style wheels, synonymous with classic British sports cars of the early twentieth century. Rear wheel drive with an admirable high power to weight ratio, the Brooklands Roadster is fully equipped with the latest technology, advanced safety features and modern conveniences. Four wheel anti-lock brake system (ABS) with Electronic Brake Force Distribution (EBD), Dynamic Stability Control (DSC) with Traction Control System (TCS) are all naturally standard, as are the front and side airbags. Power Retractable Hard Top is standard – available with either 6 speed manual or 6 speed powershift transmission with paddle controls. The Brooklands is priced at £57,500. The new Infiniti Q60 is a premium sports coupe that combines expressive design with exhilarating performance and dynamics and will be on display for the first time in the UK at The London Motor Show. 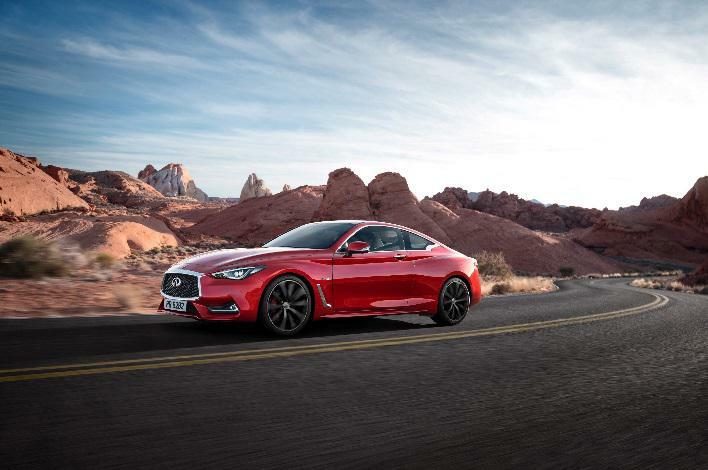 Daring proportions and taut, muscular lines provide the Q60’s impulsive exterior – lower and wider than predecessors. Dynamic enhancements, including an all-new lightweight and sophisticated 3.0-litre V6 twin-turbo engine, together with new adaptive steering and digital suspension system, result in a premium sports coupe designed and engineered to perform. As standard for this version, power is channelled through the Q60’s rear wheels for optimal dynamic response and to benefit steering feel. The Q60’s aggressive stance gives a greater impression of stability and in-control driving potential, while its lower centre of gravity has a positive overall effect on driving dynamics. Dynamic. Sporty. 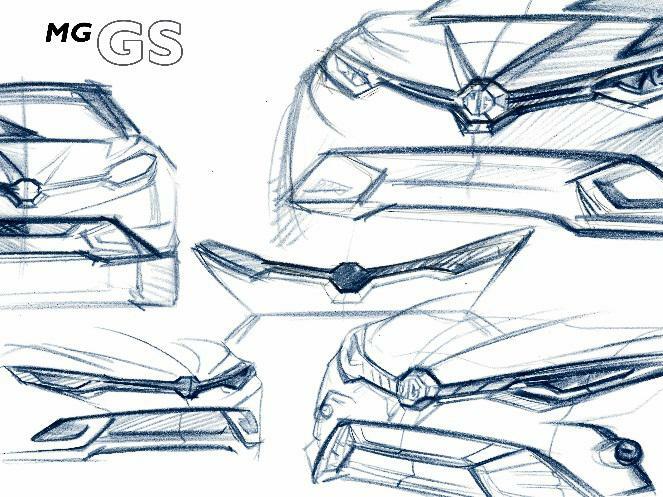 Modern – three words that perfectly describe the MG GS that’s launching in the UK in June and will be on display for the very first time at The London Motor Show. The new SUV from MG exudes confidence and dynamism that sets it apart from the other models. This competitive car shows MG as a forward-thinking, consumer-conscious brand that produces great cars that appeal to anyone at any point in their life. This highly anticipated car is a real turning point in the history of MG.
a seven-speed seamless-shift transmission with adjustment through Normal, Sport and Track settings to produce one of the most rewarding driving experiences. 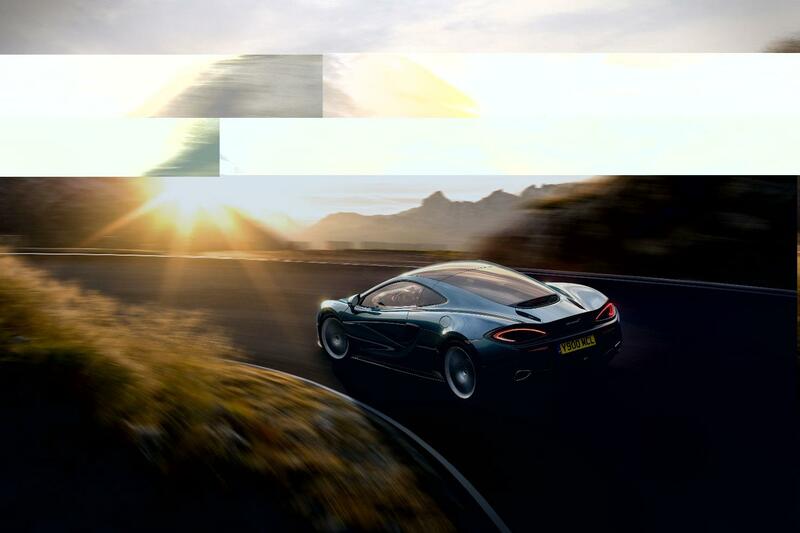 The McLaren 570GT will be on display on stand L63 at The London Motor Show. The UK pricing starts from £154,000 and customer deliveries are scheduled for July 2016. Consumers – Friday 6th May: 10.00am – 6.00pm, Saturday 7th May: 10.00am – 6.00pm, Sunday 8th May: 10.00am-5.00pm. Gigabyte has announced the launch of four new models joining the company’s extensive list of Intel® Thunderbolt™ 3 certified devices: the BRIX GB-BSi5T-6200, GB-BSi5HT-6200, GB-BSi7T-6500 and GB-BSi7HT-6500. Featuring the latest Intel® 6th generation Core™ processors, and now official support for the world’s fastest transfer protocol with Thunderbolt 3 over USB Type-C™ port, these new BRIX enter a new category of their own as a powerfully compact high-end PC. Challenging the essence of how we define a desktop PC, GIGABYTE engineers have developed an ultra-compact PC with a brushed aluminum surface chassis design. Ideal for a broad range of computing applications at home or in the office, the BRIX expounds sheer simplicity and convenience. With a comprehensive choice of processors covering the entire performance spectrum, the BRIX sets a new standard for desktop miniaturization that makes it perfect as a discreet HTPC/multimedia hub, an ultra-low power PC for the family, an office PC or as a digital signage unit. The new Thunderbolt™ 3 protocol, which is available over a USB Type-C™ connector on the back panel of the GIGABYTE BRIX T models, brings an unprecedented single-wire bandwidth of up to 40 Gb/s — twice more than the previous generation of Thunderbolt! This incredible increase in bandwidth is also accompanied with support for different protocols such as DisplayPort 1.2, which is able to drive a 4K resolution display at 60 FPS, and USB 3.1, also backwards compatible with USB 3.0 and USB 2.0, opening up a world of new possibilities. Additionally, Thunderbolt 3 over USB Type-C has the ability to daisy-chain up to 6 devices, helping you to declutter your desktop and have a true one-cable solution. GIGABYTE introduces the ultra-fast 10Gb/s USB3.1 Gen. 2 protocol to its BRIX units over the new reversible USB Type-C™ port. 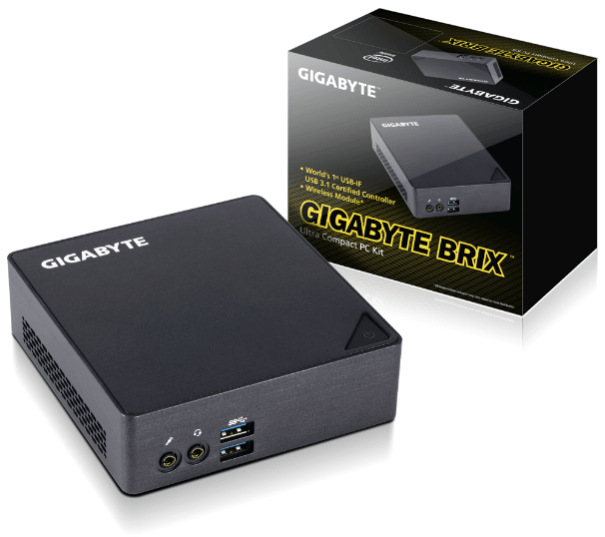 Powered by the Intel® USB3.1 controller which utilizes 4 PCIe Gen. 3 lanes, the GIGABYTE BRIX Type-C port is presented with a wide and uncompromised bandwidth to reach the limits of the USB 3.1 protocol and make back-ups or file transfers as quick as possible. Without the need for an additional graphics card, the BRIX offers support for multiple displays via the Mini-DP and HDMI 2.0 ports. Thanks to Thunderbolt 3, you can alternatively configure your multi-display setup from the Mini-DP to the Type-C port. The BRIX offers a variety of configurations which makes it the perfect choice as a high productivity PC in a professional and a home environment. Other use case scenarios may include industrial and commercial multi-display applications. The BRIX is truly a one of a kind, versatile and flexible PC. Despite its compact footprint and slim profile, the BRIX offers plenty of connectivity with four USB 3.0 ports, one USB Type-C port (USB3.1 and Thunderbolt 3), one SD card slot, an HDMI 2.0, a Mini-DP (DisplayPort 1.2), gigabit LAN as well as headset and microphone jacks. Additionally with its bundled VESA bracket, it offers a simple and elegant way to turn any VESA compliant display or TV into a full-featured PC or digital signage unit.